1. Do a favor for someone. I agreed to babysit one night for my sister, but only if she read a leaflet first. 2. Ask for someone to read a leaflet, in lieu of giving you a present for your birthday. 3. Serve someone a delicious vegan meal or dessert, to peak interest in a leaflet that promotes veganism. I wanted to write about my own frustrating experiences at trying to get my family and friends to have the same reasonable responses to the cruelty of modern farming that I had when I found out what goes on in modern agriculture. I was sure that the strength of my relationship with them would compel them to take the issue seriously and stop supporting cruelty to animals. By and large, this has not been the case. But I did not give up in my commitment to end as much suffering as I could -- I expanded my efforts. It is statistically unlikely that a significant number of those we are close to will have the honesty and motivation to change when informed of the brutality of modern farming. But taking the message to a wider audience -- like students who are conveniently gathered for us on college campuses -- is likely to bring about big results as we sift through the population looking for those who are brave and honest enough to look seriously at the issue and make changes. Years ago I decided to stop beating my head against a wall in debating my sister about God's views on battery cages, and to start showing up with booklets where I was needed -- where I could reduce the most suffering. This may lead to a whole conversation about the benefits of veganism, including environmental and health benefits. Don't offer information about factory farms unless you're asked for it, because this will just give you a bad reputation as being the pushy one who ruins happy family events. We must keep the door of communication open. Continue to show them love and look for ways to connect with them. For instance, there are many ways that our views and their concern for sentient beings intersect, such as sharing in the loss of a beloved pet. Along the same lines, anyone who has accidentally hit a deer or dog while driving knows the devastation of being the direct result of that animal's death. Being there for others at such a time and seeing your compassion and grief will be remembered. Their circle of compassion can widen when they relate these experiences to the death of other such creatures who are bred for the sole purpose of food production, leather or fur. Triggering these connections in their minds can be done lovingly even though we feel so desperate and urgent about the matter. If we are a continual dump truck of "gross pictures" or information that incriminates their culturally-accepted choices, they are overwhelmed in the wrong way. This all takes time as we live our life around others. The way of handling this varies from person to person and evolves over time. For me, for now, I figure it may be years before people, including those I care about, will be able to face the suffering that goes on. When someone says they couldn’t bear to see explicit videos, I acknowledge that seeing them would be painful. When someone says they couldn’t bear to give up meat but that they like this or that vegetarian food, I let them know that any time they choose to eat vegetarian, they are reducing the demand on and suffering of animals. When someone says that certain foods are part of their tradition, I acknowledge that it feels important to connect with family members who may have passed or moved on, and food can provide link. Then I may ask if there might be a way to balance maintaining some traditions and adjusting others. When the opportunity presents itself to plant a seed about animal suffering, I try to keep my statements brief and poignant -- a picture that I think is most likely to reach the person I am talking to. This may be pointing out that pigs are as smart as dogs, that dairy cows have their babies taken away and mourn year after year, that up to 18 hours of crowded transport to slaughter with no food or water is accepted practice. By picking only one or two things to say, so much is left unsaid, and that is hard to do. But going further with a reluctant or resistant audience is likely to lead to my being shut out, and the opportunity to plant a seed will be lost. For now, I view myself as one of several seeds someone will need before they really hear and comprehend how tragic the life of most animals is. I want to do my part in planting a seed so that when the next seed is planted -- likely by someone I don't even know -- it will have a greater chance of being the one that takes root. I have tried ************** to talk with my family about the cruelty of factory farming. I have no idea what you are saying Ebyam. 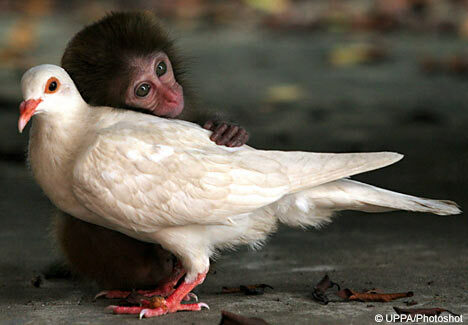 alas...tha pigeon sais to tha monkey...did you hit a wall...? more importantly that trying to figure out what Ebyam is saying...to me...is admitting that this topic has not changed anyone's eating habits and is just an attempt at promoting self righteousness...when the vegans, encourage more killing that the meat eaters... and eat their food while it is still alive...which when examined without extreme prejudice, is far more cruel. On her TV show yesterday, Oprah welcomed bestselling author and spiritual counselor Kathy Freston to talk about her new book Quantum Wellness. In her book, Kathy describes the 8 pillars of wellness, practices she believes are the staples of an engaged life. There's one wellness practice that Kathy says should be observed above all others. "The mother of all pillars is conscious eating," she says. "It doesn't only make a difference to our own personal health and well-being, but conscious eating means you stay aware of where your food comes from, how the animals are treated, and how the environment is affected by the foods that you eat. You take in the energy of whatever went into creating that food." To jump-start your self-makeover, Kathy says a 21-day cleanse can improve the way you look and feel. "We just take a few things that are irritating to our bodies and we eliminate them for any time up to 21 days," she says. Oprah has committed to the 21-day cleanse, which includes eliminating animal products from her diet. Today is day four. By featuring Kathy Freston on her show and highlighting how a vegan diet is beneficial to humans, animals, and our environment, Oprah is bringing a positive message to her viewers that has the potential to save countless lives. Have you been thinking about switching to a vegan diet? Begin today! You can read more about Kathy’s book, learn about the 21-day cleanse, and follow along with Oprah’s journey here. Together we can all making the world a healthier, more compassionate place. Well, I feel like I got baptized in Vegan Land today. Kathy Freston sent her chef, Tal Ronnen, to help me and three friends at Harpo who are doing the 21-day cleanse. Watch Oprah and the executive producers enjoy lunch made by chef Tal Ronnen. I do not need permission from you or your analysis of what my intention is... or a judgment on your part for what motivates me to use the virtues of the heart to express mySELF. yes, I believe I mentioned living on sunshine a few places (including links) in this topic already... I am serious about learning this... and honestly believe that eating was originally for amusement...until it became an addiction. Just bumping this because there are some good posts in here including people no longer here. The posts dissappear from here when they have not been used for a year. For petes sake SD grow up a little? If what you say is true then I shant peg the rest of the threads I was going to. In addition to my concerns I have received IM's asking certain questions that would best be served by that person reading historic data. When you constantly mention "Goona" - your name for the lovely Ms Oona - then it makes people wonder who she is. I have grown up enigma... I don't need to play "pretend" anymore, as you do... and make up stuff as you go along as an excuse for following through on some agenda you have in this forum... you have never been interested in discussing the WMMs... diets are not discussed in the WMMs. Today I smashed a Gnat in the kitchen and it felt good. I killed many single celled bacterium as well. I remember hunting giant hogs who would have killed me. I remember running aside brother Buffalo as he sacrificed himself to feed our tribe. But all this does not account for corporate chicken hatcheries, beating seals for fur and countless abuses of pets. So go ahead and be better than I am, see if I care. I'll be the guy eating the cheeseburger and using soap made by 3 Chinese underpaid wage slaves from Walmart, hand soap to kill those poor parasites who would have lived if I were a smelly hippy. We all need to be more free, this is just my way. The unclean mixing of the cheese-milk of the mother with her ground-flesh between two buns. Drive through to forward window, please.